Phantom Recall - Say it Isn’t SO!!! Children's Tylenol Recall: Did 'Culture of Mediocrity' at McNeil Labs Affect Children's Medicines? I found the following recall information today by going to the Johnson & Johnson website and checking out Featured Stories. 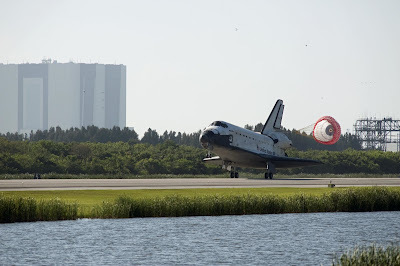 Space Shuttle Atlantis and six astronauts ended a journey of more than 4.8 million miles with an 8:48am EDT landing Wednesday at NASA's Kennedy Space Center in Florida. The flawless landing wrapped up a highly successful mission to deliver the Russian-built Mini Research Module-1, known as "Rassvet" ("dawn" in Russian), to the International Space Station. "It was smooth as silk," STS-132 Commander Ken Ham said of Atlantis' entry and landing. 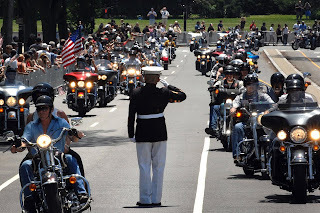 "We were clearly riding in the middle of a fireball, and it was spectacular. The windows, all of them, were bright, brilliant orange. One of the neatest things was when we flew right into orbital sunrise." This was the final scheduled flight for Atlantis, which has logged more than 120 million miles during its 25 years of service. The orbiter will go through standard prelaunch preparations as the "launch-on-need" vehicle for Endeavour's STS-134 mission. That flight currently is targeted for November. "Atlantis treated us very well. She was just an incredible ship," Mission Specialist Michael Good said, citing the precision of the deorbit burn as an example of Atlantis' performance. "The engines had it trimmed out to within .01 of what the burn was supposed to be." 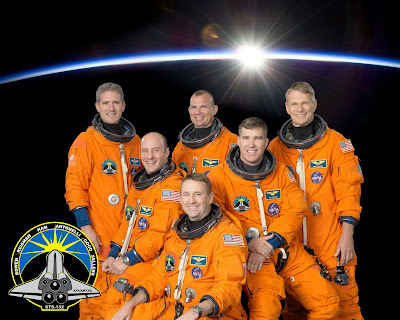 The all-veteran astronaut crew will head home to Houston on Thursday. The public is invited to attend the welcome ceremony for the crew Thursday at 4 p.m. CDT at Ellington Field's NASA Hangar 276. 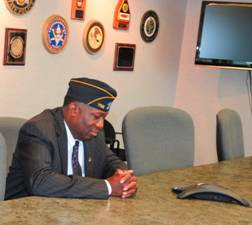 "We're thrilled, because we accomplished the mission that was put in front of us," Ham said. He explained that in addition to the technical objectives of the 12-day mission, the astronauts also wanted to enjoy themselves and share their enthusiasm of spaceflight with the world. "We've been hearing stories about how folks have been having fun and enjoyed watching us have fun, and that's really important to us." Note: This WAS the last scheduled mission EVER for Space Shuttle Atlantis. Yep... To the history books she now goes! About this video: STS-132 Commander Ken Ham and his five crewmates: Pilot Tony Antonelli and Mission Specialists Garrett Reisman, Steve Bowen, Mike Good and Piers Sellers are safely back on Earth after Space Shuttle Atlantis glided to a picture-perfect landing at NASA's Kennedy Space Center, Fla. on Wednesday morning, May 26. It was Atlantis' 32nd and final flight, traveling a total of more than 120 million miles. The 12-day, STS-132 mission delivered the Russian Mini Research Module-1, Rassvet ("dawn") to the International Space Station. Now let’s check out the launch again too. Pretty COOL stuff, with music! About this Video: Space Shuttle Atlantis and the STS-132 crew begin the journey to the International Space Station on May 14, 2010. About this video: Highlights of Atlantis' STS-132 mission to the International Space Station are presented in images and video. Mission Specialists Garrett Reisman and Stephen Bowen completed the first spacewalk of the STS-132 mission at 3:19pm EDT. They installed a second station space-to-ground Ku-band antenna and a spare parts platform on Dextre, the two-armed robotic Special Purpose Dexterous Manipulator. 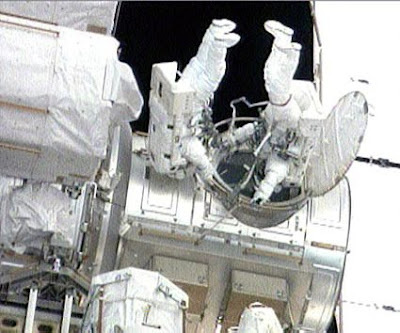 The spacewalk lasted 7 hours, 25 minutes. Reisman and Bowen began the spacewalk at 7:54am. Mission Specialist Michael Good and Pilot Tony Antonelli, the intravehicular officer, assisted the spacewalkers from inside the orbiting complex. Support for robotic arm operations was provided by Mission Specialist Piers Sellers and Flight Engineer Tracy Caldwell Dyson. Meanwhile, Commander Ken Ham was overseeing the activities and work on transfer of supplies to the station. Space Shuttle Atlantis lifts off from Launch Pad 39A at NASA's Kennedy Space Center in Florida on-time at 01:20pm CDT, Friday, May 14, 2010. Friday’s Launch looks like a GO! 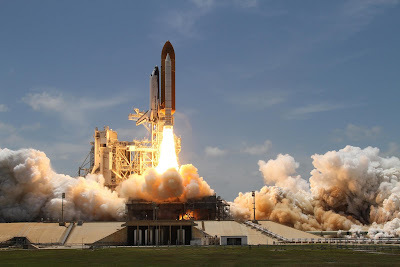 Space Shuttle Atlantis enjoyed a near flawless countdown and launch from NASA's Kennedy Space Center in Florida on May 14, 2010, to begin the STS-132 mission. Launch went off on time at 1:20pm CDT. The six-member crew of STS-132 began their 12-day mission to the International Space Station with the May 14th liftoff of Space Shuttle Atlantis at 2:20pm Eastern from NASA's Kennedy Space Center, Fla. Commander Ken Ham, Pilot Tony Antonelli and Mission Specialists Garrett Reisman, Steve Bowen, Mike Good and Piers Sellers are delivering to the ISS a cargo carrier filled with spare parts and Rassvet, the Russian Mini Research Module-1. After almost 25 years and more than 115 million miles, Space Shuttle Atlantis is down to just one final mission - but it will be going out on a high note. STS-132 will deliver to the International Space Station the Russian Rassvet Mini-Research Module-1, only the second Russian module to ever be carried into space by a space shuttle. It’s a fitting final payload for the orbiter that not only launched the first into space, but also was the first shuttle to dock to the Russian Space Station Mir – in fact, Atlantis was the shuttle behind seven of the 11 shuttle missions to Mir. "Atlantis has a history of being the shuttle that did the most international things," said Emily Nelson, lead space station flight director for the mission. "It’s the orbiter that the Russians have known best, because it’s one that came to their space station most often, and it’s one that we used to deliver a module for them in the past." Whether or not they recognize it by name, many people are likely familiar with Atlantis’ work. Besides the visits to Mir, Atlantis carried the Magellan Spacecraft into orbit, sending it on its way to Venus, where it mapped 98 percent of the plant from orbit. The same year – 1989 – it also deployed the Galileo Spacecraft to Jupiter, where it collected data on the planet and its moons for eight years. 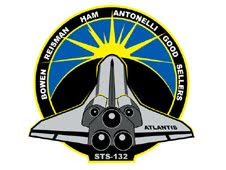 Closer to home, Atlantis has visited the International Space Station 10 times – STS-132 will be its 11th trip – delivering among other pieces of hardware, the United States’ Destiny Laboratory and Europe’s Columbus. And just last year it made the final flight to the Hubble Space Telescope, bringing upgrades that should allow the telescope to see further into the universe than ever for years to come. "Atlantis has clearly been a work horse of the space shuttle fleet over the years," said Mike Sarafin, lead STS-132 shuttle flight director. "The shuttle program history is pretty complicated, but I think it will show that Atlantis is a remarkable vehicle." But Atlantis is not finished making history just yet – there are still a few firsts in store. For instance, the installation of Rassvet. Normally when a new piece of the space station is installed, all the work is done (the hooks are engaged and the latches latched to attach the new module to the rest of the station) from the space station side of the equation. That’s true for all of the international partners involved in the station except for Russia. Until now, the Russian modules have all been launched into space on their own, not carried up by a space shuttle, and the Russian system makes use of that by relying on the momentum of the new module as it approaches to force the latches. That won’t be possible this time around. Instead, the STS-132 crew will use the space station’s robotic arm to attach it. The arm will be extended to just about its full 58 feet to reach Rassvet’s home on the Zarya module, which will make it difficult to push with much force. In addition, the commands to the module to work those latches and hooks will have to take a long circuitous route from the robotic arm controls inside the Cupola, through the United States segment of the station to the Russian segment, then back to the United States segment and out through the robotic arm to the Rassvet. "Installing that module is going to be an interesting day," STS-132 Commander Ken Ham said. "If anything goes wrong in this delicate plan, we have to get it to work right. 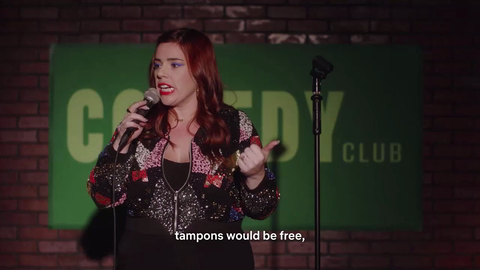 We think, based on the analyses, that we’re going to be just fine. However, we’re prepared for all sorts of problems that could arise getting that thing in there." If the team is lucky, some of Atlantis’ good luck will rub off on the module while it’s in the shuttle’s cargo bay, and the installation will go off without a hitch – Atlantis tends to be the member of the shuttle fleet with the fewest problems in flight, so it wouldn’t be out of character. "Like any home or any car that you’ve had over the years, the shuttles have their nuances," Sarafin said. "Atlantis tends to behave very well when it’s flying. That’s a nice luxury to have." 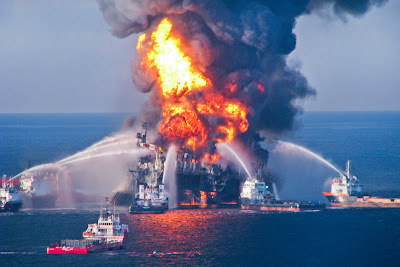 This file photo shows Fire Boat Response Crews battle the blazing remnants of the oil rig Deepwater Horizon off the Louisiana coast in the Gulf of Mexico. About following Video: A BP official says ice crystals have formed inside of the oil containment box that was placed over the massive oil leak. That's forced crews to move the box away to study the problem. Attired in training versions of their shuttle launch and entry suits, these six astronauts take a break from training to pose for the STS-132 crew portrait. Launch of Space Shuttle Atlantis on its STS-132 mission to the International Space Station officially is set for May 14 at 2:20pm EDT. At NASA's Kennedy Space Center in Florida, technicians working at Launch Pad 39A will replenish the liquid hydrogen storage tank and perform recharge operations for the gaseous oxygen. Commander Ken Ham will lead the six-member astronaut crew during the 12-day flight. With their launch date finally official, the astronauts are enjoying a day off from their training. Top NASA managers made the launch date official at the end of Wednesday's Flight Readiness Review at Kennedy Space Center in Florida. "We had a very thorough review today. We went through all the things that happened on the vehicle, both the shuttle and also the station," said Bill Gerstenmaier, associate administrator for Space Operations. "The vehicle is ready to go fly. It's a true testament to the work the teams have done down here at [Kennedy]." Atlantis and crew will deliver an Integrated Cargo Carrier and a Russian-built Mini Research Module. 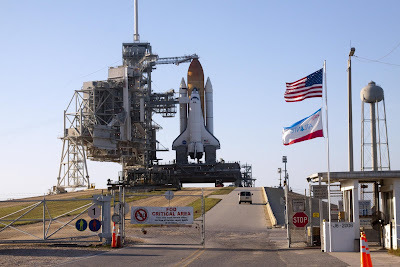 The countdown will begin May 11 at 4 p.m. when countdown clocks at the Oceanside Launch Complex begin ticking backward from the T-43 hour mark. 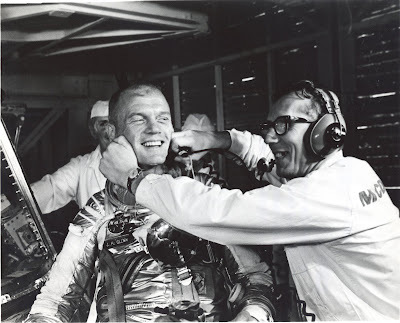 Guenter Wendt, on right, the original pad leader for NASA’s manned space program, coaxes a smile out of astronaut John Glenn after the MA-6 mission was scrubbed. Guenter Wendt, the legendary pad leader who often was the last person astronauts saw before going into space, died at his home Monday morning, [May 03, 2010] in Merritt Island, Fla., within a few miles of NASA’s Kennedy Space Center. Wendt had been hospitalized with congestive heart failure and suffered a stroke. He was 85. He worked at Kennedy for 34 years. Wendt, a naturalized American originally from Germany, spoke with a thick accent and made a reputation as a strict overseer of the launch pads and spacecraft astronauts flew. Those traits earned him the nickname “Pad Fuhrer.” He also was the first pad leader for crewed spacecraft. Fact was, Wendt was never far from the space program. He stood watch over the Mercury and Gemini missions. The contractor for the Apollo spacecraft did not retain him as a full pad leader, Wendt recorded in his memoirs. So, Wendt was at home when the Apollo 1 fire erupted and killed Gus Grissom, Ed White and Roger Chaffee as they ran through a countdown test at Launch Pad 34. Afterward, astronauts including Wally Schirra insisted on Wendt’s return. Wendt was in charge of the White Room and launch pad when Schirra and his crew lifted off on Apollo 7, the first crewed Apollo mission after the fire. Wendt saw all the Apollo astronauts off on their way to the moon, too, before working as the head of flight crew safety for the Space Shuttle Program. He later served on the investigation board that reviewed the Challenger accident. He retired in 1989, but still didn’t leave the space program far behind. He worked as a consultant on Hanks’ production “From the Earth to the Moon,” and also worked with the team that recovered the Liberty Bell 7 spacecraft from the bottom of the Atlantic Ocean. That was the Mercury capsule Gus Grissom flew into space, but the spacecraft filled with water after splashdown and sunk. He also returned to Kennedy on occasion and spoke with today’s spaceflight engineers, technicians and specialists. Wendt is survived by three daughters. Says fighters ARE coming to U.S.
Faisal Shahzad praised by Pakistan Taliban spokesman who says 'fighters' are coming to U.S.
* Photo for the Day * Vietnam Veteran Duane M. Jackson, a street vendor who alerted the NYPD of the suspicious vehicle in Times Square on May 1st, is pictured here talking to President Obama via telephone. "At approximately 11:45 P.M. EDT, Faisal Shahzad was taken into custody. Agents of the Federal Bureau of Investigation and detectives of the New York City Police Department arrested Shahzad for allegedly driving a car bomb into Times Square on the evening of May 1, 2010. Shahzad, a naturalized U.S. citizen born in Pakistan, was taken into custody at John F. Kennedy International Airport after he was identified by the Department of Homeland Security’s U.S. Customs and Border Protection while attempting to take a flight to Dubai. The defendant will appear in Manhattan federal court (500 Pearl Street, 5th Floor, New York, N.Y.) on May 4, 2010, at a currently undetermined time to be presented on formal charges. No further details are available at this time. We applaud the collective work of the New York Joint Terrorism Task Force and the prosecutors and investigators in the Southern District of New York, who have worked around-the-clock for the last two days in this investigation. We would also like to recognize the diligent work of the Customs and Border Protection agents and the U.S. Attorney’s Office for the District of Connecticut. The investigation remains very much ongoing, and the dedicated agents, detectives, and prosecutors on this case will continue to follow every lead and use every tool to keep the people of New York City safe. We will not rest until every terrorist, whether homegrown or foreign-based, is neutralized and held to account," said United States Attorney Preet Bharara, FBI Special Agent-in-Charge George Venizelos, and New York City Police Commissioner Raymond W. Kelly. About above image: Unified Command releases an image showing booming locations as of May 2. 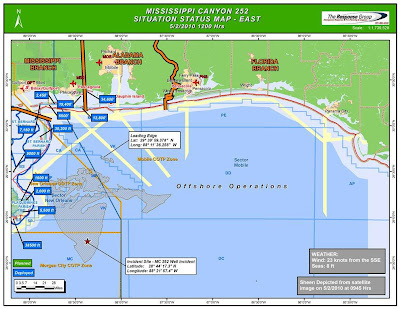 The numbers in blue indicate where boom has been deployed and the numbers in green are planned deployments. 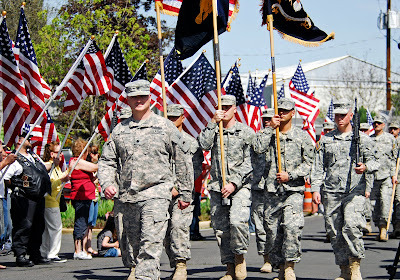 Lt. Col. Gregory Day, Commander, 1st Battalion, 186th Infantry, 41st Infantry Brigade Combat Team, Oregon Army National Guard, leads his unit during a parade through Medford, Ore., April 24th. The unit demobilized during a ceremony following their 400-day deployment in support of Operation Iraqi Freedom as part of the largest mobilization of Oregon Guard members since World War II. Times Square Failed Car Bombing An International Plot? About above news video: Police release video of a man who may have planned to detonate a car bomb in Times Square. And YES... I would think that this will be the death nail in the Obama Administration’s Coffin on ever thinking again on trialing Guantanamo Bay Terrorist in New York!